Regenerative farming is a sub-division routine with regards to natural cultivation intended to construct soil wellbeing or to recover undesirable soils. The practices related with regenerative farming are those related to different ways to deal with natural cultivating, including keeping up a high level of soil organic matter(SOM), no-tillage/minimum tillage, biodiversity, compost, mulching, rotation of crops and green manures. Cover crops and no-till farming, which fabricates soil wellbeing, encourage carbon sequestration through the air-to-soil and soil-to-air, lessens or wipes out the requirement for fertilizers, and limits soil erosion. As it were, cultivating in nature's way by mimicking nature, tackles a huge number of issues. More cover crops and no-tillage would lessen soil disintegration and nutrient supplement run-off. 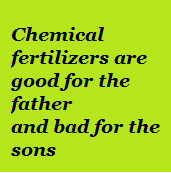 This would lessen fertilizers inputs that are important to plant growth and would advance carbon sequestration in soil. A considerable measure of times we've concentrated throughout the years on NPK: nitrogen, phosphorus, potassium. This can cause issues after some time. It's not a long haul technique. Let's assume you're cultivating corn, with [NPK] manure. You can help yields, but you are burning organic matter in soil which is the thing that holds the supplements. You can enforce the plant growth to become speedier and bigger than it's intended to, which exhaust it and vulnerable to pests/diseases. One essential advantage of trace components is they enable the plant to deliver catalysts that reinforce the plant and make what are called optional metabolites. Those impact flavour, colour and vigour. Plants utilize them as communication/transmission signals, so when you plant in a living soil, it is ready to develop to its hereditary potential.This is so powerful. These procedures have been occurring for many years naturally in the soil but we've sunk it up in last 50 years. We've grown a lot of food but ruined our soil strength. Nature has its own framework. We have to figure out how to imitate the framework, not attempt to control it. One approach to feed and nourish the soil, not the plant. Give the soil a chance to nourish the plant. If we understand soil science/nature regenerative framework, the more we feed soil-soil will feed the plant. Individuals see a few plants as weeds. Frequently consider that is a result of the condition of the soil and adds fertilizers again and again and makes soil imbalance which will create a situation where certain weeds will flourish. They can challenge the plants you're attempting to develop. Observing at the nutrients ratio in the soil manages the issue. We're endeavouring to get to the root of the issue, not manage its symptoms.Bacteria contain more protein than protozoa can clutch, which is discharged as nitrogen/ammonia which is a plant-accessible supplement. Microbes live in the leaves of the plant, as well. So spraying liquid manures(microbes) on the plant you help secure it and diminish the odds that pathogens will involve the leaf. A similar thought works in the soil. Healthy/well-balanced soil sequesters a huge amount of carbon.